HomeNewsEnergyEFSBInvenergyJerry Elmer: The ISO FCA-13 results show that Invenergy is NOT needed! The results of the ISO’s Forward Capacity Auction this week show once again – strongly and unequivocally – that Invenergy’s proposed fracked gas and diesel oil power plant is not needed. The ISO has just published the results of this week’s auction; you can see the ISO press release, here. The ISO has conducted four Forward Capacity Auctions (one each year) since the Energy Facility Siting Board has been considering whether to grant Invenergy a permit to pave over a forest in Burrillville to build a power plant – and this is the fourth consecutive auction that has shown that the plant is not needed. This is another nail in Invenergy’s coffin. ISO-NE is the nonprofit, federally regulated, entity that runs the electricity grid for the six New England states. The ISO is the entity that is responsible for ensuring that we will have enough electricity in the future to keep our electricity grid safe and reliable. In other words, the ISO does the planning to make sure that we will have enough electricity to keep the lights on. On Monday, February 4, 2018, the ISO conducted FCA-13, the thirteenth annual FCA. In FCA-13, the ISO was seeking to procure electricity generating capacity from both existing and new generators for the ISO’s Capacity Commitment Period-13 (CCP-13), which runs from June 1, 2022 through May 31, 2023. The ISO has just published the results of FCA-13 (conducted earlier this week), and those results show – once again – unequivocally that the ISO does not need and does not want the electricity from Invenergy’s proposed power plant. Back in FCA-10 (Feb. 2016), one of Invenergy’s two turbines cleared the auction and acquired a Capacity Supply Obligation (CSO) for 485 MW. However, on September 20, 2018, the ISO involuntarily terminated Invenergy’s entire 485 MW CSO. (That is, the termination was involuntary for Invenergy, which protested strongly.) This was the first time in the history of the ISO that it has ever involuntarily terminated an entire CSO on a Resource, and is a very, very strong indication that Invenergy is not needed. Then, on September 28, 2018, the ISO told Invenergy that its second turbine was not qualified to even participate in FCA-13 (this month). As a result of these two actions, neither of Invenergy’s two proposed turbines (together totaling about 1,000 megawatts (MW) of capacity) were even allowed to participate in the ISO’s FCA-13 conducted this week. In other words, all of the results of FCA-13 shown below occurred without Invenergy even being allowed to participate in the auction. That’s how much the ISO believed that Invenergy is completely unnecessary to keep the lights on! In FCA-13, the Installed Capacity Requirement (ICR) for all six New England states was 33,750 MW. The ICR is the amount of capacity the ISO was trying to procure. In fact, the ISO cleared fully 34,839 MW in FCA-13, 1,089 MW more than the ICR! And that was without Invenergy even participating! Moreover, note that the surplus that the ISO procured this year (1,089 MW) is greater than Invenergy’s entire project (1,000 MW)! In FCA-13, the clearing price in the auction was $3.80. This is an important piece of information because the clearing price reflects how supply and demand in the market match up. A high clearing price would have shown that there may not be enough supply to meet demand, but this was a low clearing price. This low clearing price shows that there is plenty of supply relative to demand – more evidence that Invenergy is not needed. In addition, there was no price separation between SENE and Rest of Pool; this shows that although the SENE zone (that includes Rhode Island) is modeled by the ISO as a potentially import-constrained zone, in the actual auction those potential constraints were not binding. Hence, no price separation. 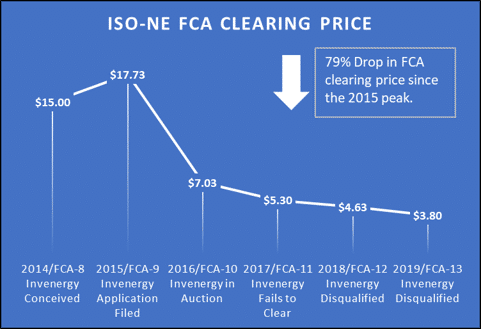 And here is one more important fact: The low clearing price this week in FCA-13 continues a consistent downward trend in FCA clearing prices that has been consistent since Invenergy filed its EFSB application on October 29, 2015. This is important because it shows that as more time goes on, Invenergy is actually needed less and less! In FCA-10 (conducted in 2016) the auction clearing price was $7.03 (a 61 percent crash from the prior year). In FCA-11 (conducted in 2017), the auction clearing price was $5.30 (a drop of another 24 percent from the prior auction). In FCA-12 (conducted in 2018) the downward trend continued, and the auction cleared at $4.63. This week, FCA-13 cleared at $3.80 – that is down yet another 18 percent over the already-low clearing price last year . And the low clearing price in FCA-13 this week was with no participation whatever from Invenergy. The graph below, courtesy of Jason Olkowski, shows the year-over-year trend in auction clearing prices. FCA-12 (conducted in February 2018) showed clearly that there is no need for Invenergy. FCA-11 (conducted in February 2017) showed clearly that there is no need for Invenergy. FCA-10 (conducted in February 2016) showed clearly that there is no need for Invenergy. As I said above, these newly released ISO-published Forward Capacity Auction results clearly show that the ISO does not need and does not want Invenergy’s fracked gas and diesel oil power plant. And the people of Rhode Island do not want to pave over a forest in Burrillville for an unneeded plant. Invenergy is not needed, and it is way past time for the EFSB to deny a building permit to Invenergy.